The development of fine motor skills in children is integral for performing everyday skills such as: dressing and feeding themselves, opening lunch boxes and brushing teeth. Children who are ill-equipped with the skills to complete these tasks can often suffer from a low self-esteem and frustration and in turn falter in their academic performance. A command of basic fine motor skills significantly increases a child’s ability to learn confidently. You can improve fine motor skills with a variety of tools and activities which will give children a sense of accomplishment. Cutting with scissors is a great pre-writing skill for children. Cutting with a proper scissor grasp, will give little fingers lots of practice in working together, and will strengthen hand muscles. This is a stepping stone towards improving fine motor skills and the developing of the correct grip required in handwriting. 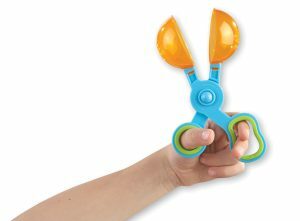 Handy Scoopers are ideal to strengthen hands and develop skills in scissor cutting. The scoops have holes allowing for catch-and-release fun at water tables. Water play with eye droppers and pipettes is a fun way to develop fine motor skills and improve the pincer grip; which is important for manipulating items such as zippers, buttons and shoes laces. Using tweezers to pick up and place items is a great way to develop fine motor skills, especially the pincer grasp. It helps to strengthen little hands and can also give them counting practice. 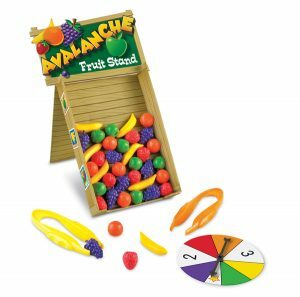 The Avalanche Fruit Stand is a fun way to build fine motor skills, colour matching, sorting, patterning and hand-eye coordination. Peg boards help to develop a range of skills such as; pincer grasp, tripod grasp, grasp and release, and bilateral hand coordination. The process of picking up pegs, pushing them into the holes and moving them from the palm to the fingers, improve and strengthen a child’s hand muscles. 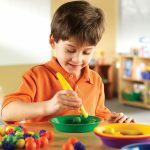 Manipulating playdough by squishing, squashing and pounding strengthens children’s hand muscles and helps develop control over their fingers. 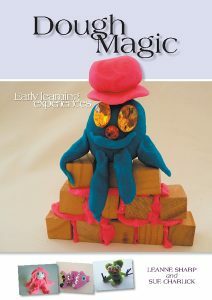 Dough Magic is a practical guide to exploring play dough in its many forms and the techniques you can use to encourage and strengthen fine motor skills. Threading beads are a great tool, not only to develop fine motor control, but to increase hand-eye coordination, patience and concentration skills. Threading beads onto a string involves bilateral coordination of eyes and hands working together. These skills help to naturally improve pencil grip and control during colouring and writing activities. Pipe cleaners are a perfect tool for children to work on their fine motor dexterity, tripod grasp, and eye-hand coordination. Pushing pipe cleaners through a colander (or a box with holes), threading beads onto them and twisting them into shapes are some simple fine motor skill activities. 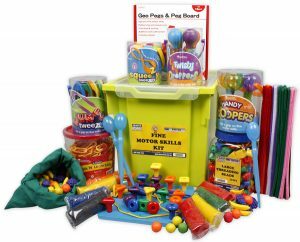 Our new Fine Motor Skills Kit features a great assortment of toys and tools that will build your children's fine motor skills. This entry was posted on September 27, 2016 by Angelique Cocco. All comments will be held for moderation before appearing on the website.